This is pretty much my life at this point. The internet block/delay came into effect a few days ago. The system simulates the communication delay that would occur due to the vast distance between Earth and Mars – up to 250 million miles when they are in opposition to each other (on opposite sides of the sun). 20 minutes is about the length of time it would take a radio signal to travel that distance at the speed of light. They system works by blocking all website and then allowing us access to a few selected sites via a whitelist with the assumption that these site could be cached on a local server on Mars. The requirement to be approved for the whitelist is that it must be fairly static (i.e. no chat feature, relatively infrequent updates, etc.). Getting things added to the whitelist is turning out to be time consuming and frustrating since most sides have dependent subdomains that also need to be whitelisted as well to work properly. Anything which gets frequent updates can only come to us via out special delayed NASA email addresses which adds a 20 minute delay to incoming and outgoing mail. Whenever we need information that we can’t get from whitelisted sites or information we’ve brought with us (I downloaded all 50Gb of Wikipedia before I left) we have to email mission support and ask for it. So if you want to send me an article/webpage you’ll have to send me a screenshot/pdf since I won’t be able to click a link. Now that setup stuff is mellowing out, we’ve had time to start working on our individual research projects. The two individual research projects that I’ll be working on during my time here are using a 3d printer to manufacture items that we didn’t bring with us and using a Oculus Rift virtual reality headset to see if it is useful in reducing the feelings of confinement from being in the dome for the next 8 months. My 3D printer arrived very slightly broken so I’m waiting on a new part for that before I can start printing things. I did get started on a few CAD models for my first printed items (some clips to hang things from shelves and a whiteboard marker holder are first up). It was fun to do some CAD after 5+ years without. My Oculus Rift got delivered by “robots” yesterday (unfortunately these robots were of the meat variety and not actual robots). I got it installed last night and gave it an initial try. First impressions was that the head motion tracking works great and that the picture leaves a little to be desired. It seems a bit out of focus (which hopefully can be adjusted away) and the resolution isn’t amazing, though perhaps that is related to the demos I used (Tuscany and a roller coaster ride). I’m working on getting some more demos whitelisted, downloaded and installed this weekend. Planning to get it a bit better adjusted and then let people try it out. In general we are starting to find our grove. During the day we spend our time emailing back and forth with mission support, doing psychological surveys (which will be the topic of a future post) and getting equipment set up. Evenings have been pretty mellow and fun. We’ve all been doing p90x together then a couple of us make dinner. The food has taken a bit of getting used to since it is all shelf stable. Mostly freeze dried for stuff like meat, fruit and vegetables. Then things like prepackaged snacks and dry ingredients like grains, pasta, flour and powdered milk as well. We’ve been getting the hang of it though. 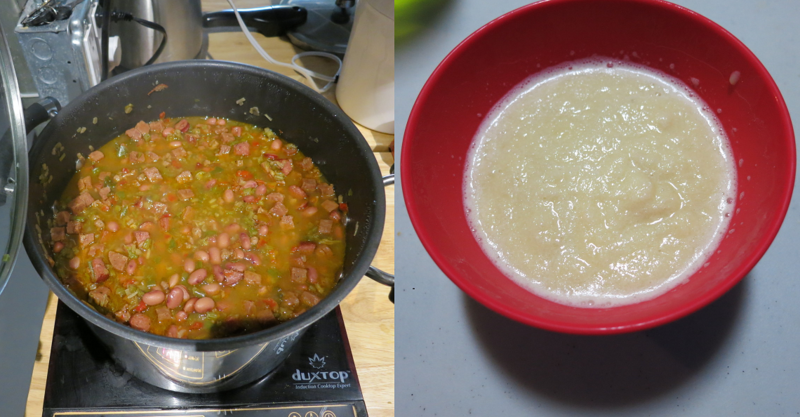 Last night I made red beans and rice and Neil made vanilla ice cream for desert (without an ice cream maker). Both were quite good if I do say so myself. After dinner we’ve generally been watching a movie or playing board games. Weird having these roommates I see all the time after living alone for the past 18 months. My apologies if the formatting of this post is horrendous. I’m currently posting via email, hopefully I’ll be able to get my blog unblocked at some point in the near future. The best part of P90X is the yoga video where the instructor suggests you use your dog or cat for balance if you don’t have a yoga block. It’s also the only part of P90X I’ve seen. We did the yoga a couple days ago but I missed that somehow. I’ll listen for it the next time we do it. We’ll there aren’t any other people on Mars, just robots, but we still manage to get supplies delivered. So my theory is the robots are made of meat. ← We are in the New York Times!